Place the gammon in a large saucepan and cover with cold water. Bring to the boil, cover and simmer for 1 hour 45 minutes, topping up with boiling water as required. Drain the gammon and place in a roasting tin, cut off the skin but keep a layer of fat and score the fat in a diamond design. Mix the honey, mixed spice and mustard together and brush over the whole joint. Bake for 15-20 minutes. Meanwhile, heat the oil in a large frying pan and fry the cavolo nero for 3 minutes. Blend the cornflour with the stock, zest and juices of the orange and lemon. Stir into the pan with the cranberry sauce and bring to the boil, stirring until thickened, simmer for 1-2 minutes until just tender. 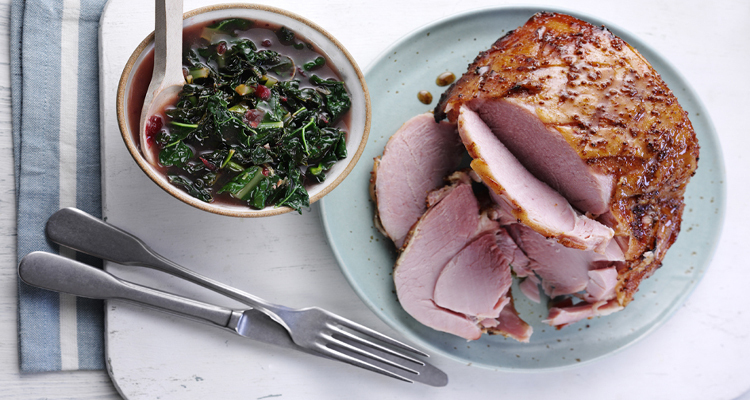 Serve the cavolo nero sauce with the gammon and new potatoes. The cavolo nero sauce is perfect to serve with left over roast turkey and sausages, or use with other cold meats for a quick supper dish.